Jets at the Aspen/Pitkin County Airport in July, 2014. 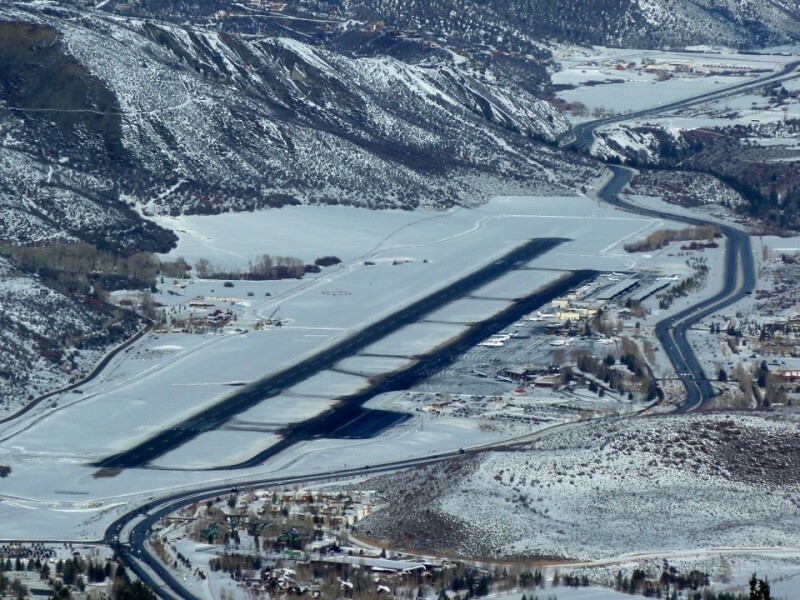 A new west-side taxiway and fixed base operator, a new runway alignment, and a new terminal are all on the list of improvements at the Aspen airport, seen here from Shadow Mountain in early 2014..
ASPEN – One jet center may not be enough to serve the growing needs of private plane users and owners at Aspen/Pitkin County Airport. The 2012 airport master plan allows for a second fixed base operator (FBO) to serve the private jet market. And airport director Jim Elwood recently told Pitkin County commissioners that a proposal submitted by Landmark Aviation in 2013 has been reviewed and now “trips a decision” that will eventually allow other parties to bid on a contract for a second FBO in Aspen. Aspen native Andrew Doremus said he is part of separate a group interested in running a second FBO here. The former owner of the Rifle Jet Center, “which grew from one airplane to an airplane charter and maintenance facility,” Doremus has flown for Tailwinds, Aspen Aviation and Airborne Express. A pilot since 1978, Doremus flies a Citation Excel out of Eagle County Airport for Mountain Aviation. Before an application from another potential FBO operator may be considered, the FAA must first approve an airport layout plan (ALP) for the Aspen airport, including the location of a new taxiway on the west side of the runway. Two years ago, the FAA approved the majority of the master plan, which has as its centerpiece a new terminal building. But it didn’t approve the ALP, which directs the location of the runways and taxiways, because the airport doesn’t meet FAA requirements and is operating under an exemption related to the distance between runways and taxiways. That’s a situation the FAA would tolerate with existing conditions, but not if it wanted to build a taxiway and an FBO on the west side. Changes to the Owl Creek Road side of the airport present its own set of challenges. Pending voter approval to use part of the Burlingame Ranch Open Space lands, the scope of work would include moving the existing runway 80 feet to the west and widening it by 150 feet. A 2,500-foot section of Owl Creek Road would need to be relocated and retaining walls built, with the entire project’s price tag expected to top $121 million. 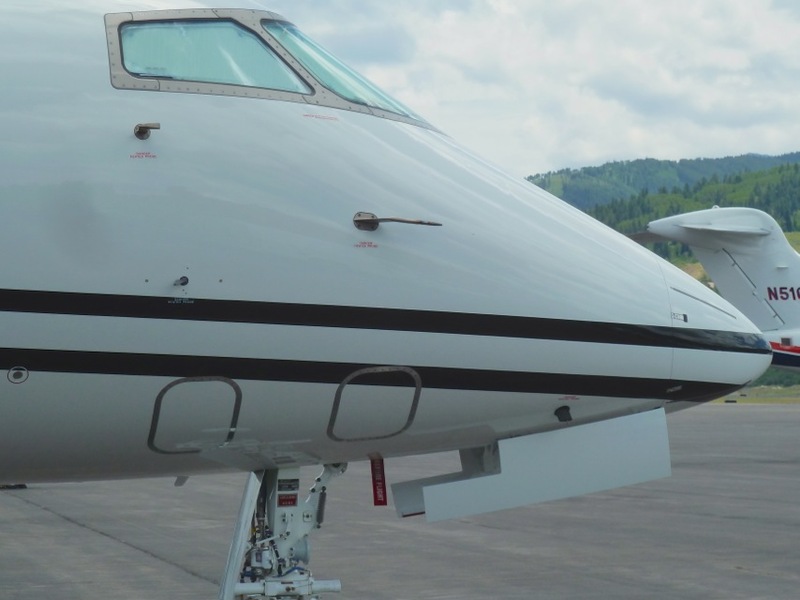 A decision by the FAA on the ALP is expected late this year or in the first quarter of 2015, at which time the “request-for-proposal” process for the second jet center could be triggered. Atlantic Aviation, whose lease continues through 2023, operates the current FBO on the airport’s east side. The facility will likely need to be moved and re-built as part of the terminal expansion. Atlantic’s CEO, Louis Pepper, has previously said he doesn’t believe Aspen needs a second jet center, despite annual fuel sales (in excess of 3 million gallons) that rival airports the size of San Diego. The seasonality of Aspen/Pitkin County Airport makes it challenging to maintain a year-round work force, something that the company says it couldn’t sustain if the FBO pie was split. During the first six months of 2014, there were almost 17,000 “operations” at Aspen/Pitkin County Airport, according to the FAA. Commercial operations comprised less than a third — or 5,191 — of those takeoffs and landings. Unlike Atlantic’s CEO, Doremus said the airport needs a second FBO to handle the private jet traffic. Landmark thinks so too. Based in Houston, the company’s locations are heavily concentrated in the eastern and southern U.S. This would be their first foray into Colorado. According to the application from FBOASE, LLC, the local partners in the venture include Sam Houston, through Phenix LLC, and Robert Epstein, through Prophet Ventures Ltd. The business would offer aircraft line services, fueling and lubricating, and maintenance among its general aviation menu. An aircraft charter and management operation, as well as ground training, flight school and aircraft rental also are proposed by Landmark. The company’s fleet of more than 60 charter and managed aircraft are “centrally dispatched from the company’s Winston-Salem, NC location,” the application said. There are specific criteria tied to the airport master plan with regard to safety and setbacks. Landmark’s application speaks to developing 18 acres on the west side of the airport, where a 9,943-square-foot facility would offer waiting areas, customer service and concierge counters. Two hangars, one at 40,000 square feet and another at 20,000 square feet, are anticipated. There would be parking for 96 vehicles. Doremus’ plans aren’t yet public but he did say that technology has streamlined how pilots use ground facilities because a lot of work can be done in advance through Wi-Fi. In past years, “The customer service area was more dedicated to people hanging around,” Doremus said, suggesting that less may be more today when it comes to the actual building size. Something else that is changing the private aviation industry “is that mom-and-pop places are starting to go away and larger professional companies are taking over the smaller ones,” he added. That’s an area with which Doremus is familiar: After 12 years as owner of Rifle Jet Center, he sold the business to Atlantic Aviation. The next six months will see stepped-up public outreach efforts by Aspen/Pitkin County Airport to share elements of the master plan and details about what’s contemplated on the west side. Elected officials have indicated they are sensitive to how some members of the public perceive this as a growth generator. In fact, the Landmark application anticipates the FBO would create 36 new jobs. Doremus said safety should be more the concern rather than growth. “The reason the FAA has decided to fund the taxiway expansion is because it will give the safety margin they want,” he said. One argument driving the runway expansion is the need to be able to serve the wider, higher capacity regional jets starting to be phased in by the airlines. Currently, United’s planes can seat 66 passengers while American’s have 63 seats. Delta also flies a 66-seat plane into Aspen/Pitkin County Airport. Higher capacity planes could promise more revenue for commercial carriers. But at what cost to the community? Doremus said Telluride’s loss of its only commercial airline service, even if it’s just temporary, demonstrates that when business conditions dictate, “airlines will pull the plug” on local service. Editor’s note: Aspen Journalism and the Aspen Daily News are collaborating on coverage of local governments. The Daily News published the story on Monday, Aug. 11, 2014.